The 2-cylinder engine putted away as the small Citroen rolled down the Clutha River Valley toward our first winery. Not seeing any button or even an old fashioned crank handle, I asked Julie how to open the window. “You push on the glass panel,” she said. “And here’s the AC” she added, pointing to a small grilled vent opening up to the outside. 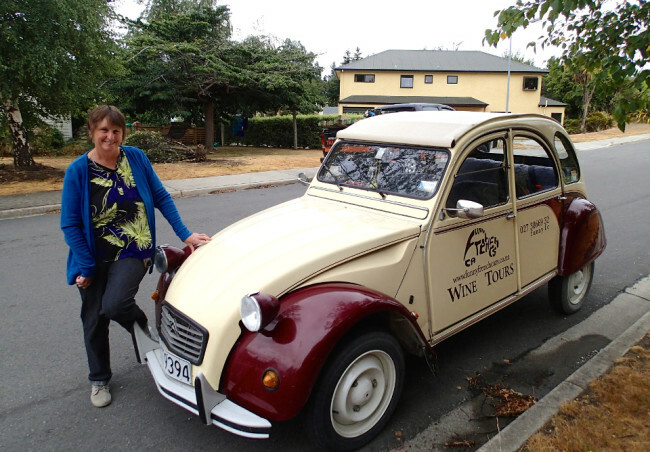 Julie’s company, Funny French Cars, takes visitors to local wineries in and around Wanaka in old refurbished Citroens 2CVs. Along with her husband Deane, she launched the company about nine years ago, to help visitors partake in an experience that they enjoyed so much themselves. The seeds for the idea were planted at least 17 years ago, when the couple saw a Citroen 2CV come up for sale and joked about buying it. One thing lead to another, and the next thing they knew, they were participating in rallies with a group of fellow 2CV owners, stopping at wineries and enjoying a picnic among the vines. Currently, the fleet consists of five Citroen 2CVs (dating from the mid to late 1980s), and a few larger cars used for weddings or bigger groups. With their burgundy and ivory paint job, and vintage look, you can’t miss Julie’s Citroens when they cruise into town! 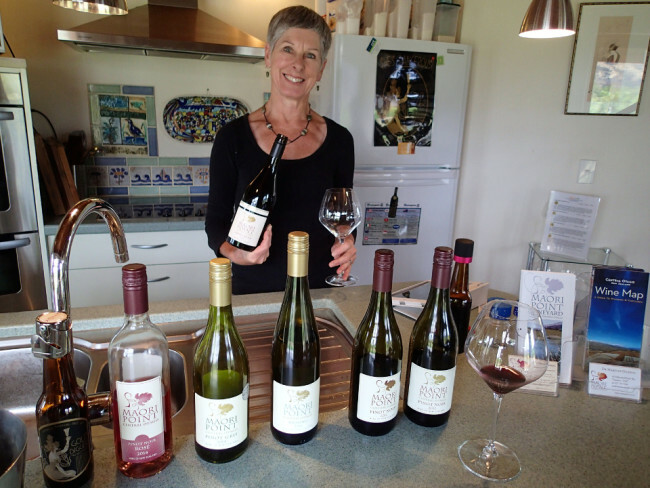 The basic tour visits two or three Otago wineries, all small family owned businesses. The signature wine of the Otago region is pinot noir, a grape that loves the dry climate of Otago, with its cool nights and hot sunny days. On that not particularly sunny Saturday morning, we arrived at Maori Point Vineyard in Tarras after a 35-kilometre drive from Wanaka on a state highway that looked to me like a rural road. At the end of the long driveway, we were greeted by a large exuberant black dog, and then by a smiling Marilyn. Julie and Marilyn seemed to be old friends. We walked into the “tasting room” which was actually the house’s kitchen! Despite the lack of formality, it was clear that Marilyn Duxson knew her stuff. Along with husband John Harris, they planted their vines in 2002, and later retired from their academic careers when their winery became profitable. Seven bottles were lined up on the counter top (or the bench as they say here). The first one was the most intriguing, as it looked like a beer bottle. 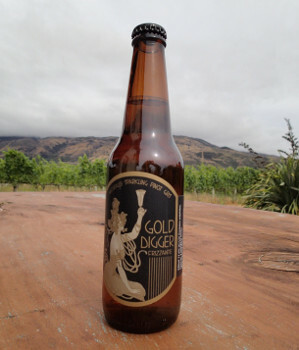 The Gold Digger Sparkling Pinot Gris is indeed a special wine. Marilyn explained that it was produced in the prosecco style, by fermentation under pressure in beer tanks. Because there is no access to equipment to bottle bubbly wine in Otago, they resorted to using the facilities at a nearby beer bottling plant, to create a unique wine. Sparkling wine in a 330 ml beer bottle! Of course I had to taste that one, and I loved it! It was fizzy, but not as dry or effervescent as a champagne. I also tasted the standard Pinot Gris (grapes picked later than for the bubbly), the Riesling, the Pinot Noir 2011, and the Pinot Noir 2013 (Grand Reserve), whose complexity was immediately obvious even to a neophyte like myself. It was not even noon yet and we had another winery to visit, so I resisted the temptation to try the Pinot Noir 2012 and the Rosé! 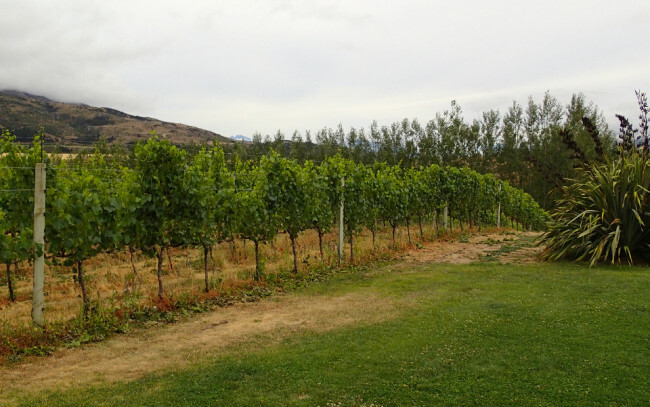 Maori Point Vineyard is open to the public for tastings, but the hours vary with the season, so check the website. We squeezed back in the Citroen and made our way back toward Wanaka, stopping on the outskirts of town for a tasting at Aitken’s Folly. 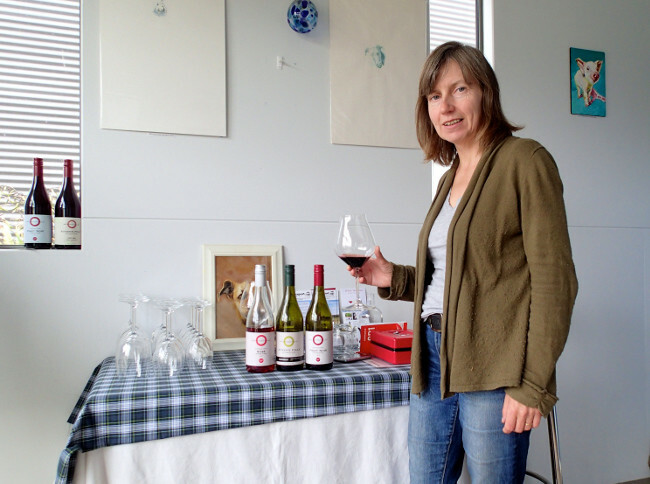 Fiona Aitken and her husband Ian Perry run a small boutique vineyard of three hectares that produces premium Pinot Noir and Chardonnay, plus a beautiful Pinot Rosé. Twenty-five percent of the vineyard is planted with Chardonnay grapes. Once again the tasting was in the family home, in a small room at the front of the house. All three wines were available for tasting. Although stored in oak barrels, the Chardonnay had the smallest hint of oak and was quite easy drinking. The rosé was also on the fruitier side, which is my preference. The pinot noir was fairly smooth, but would taste even better with food, in my opinion. Aitken’s Folly started in 2009 but has only been producing wine for a couple of years and opened to the public in December 2014. The cellar door is open all year for tasting and sales by appointment. The Central Otago Wine Map shows 87 wineries in the region, but most are located outside of Wanaka, requiring a vehicle, and many are open by appointment only. Funny French Cars offers a few different wine tours. 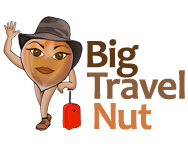 The basic tour called Gold Digger Wine Trail, lasts three hours and costs NZ$129 (US$84). For a splurge, consider the Foodie and Wine Lovers Tour, a decadent day of food, wine, gorgeous scenery, history and local encounters. All the wine tours visit small family owned wineries. If you’re not into wine, you can still explore the area in a Citroen 2CV on a Wanaka scenic tour that not only visits the stunning landscapes but also gives you an overview of Wanaka and its people. All the tours also include pickup from your Wanaka accommodation. Julie’s husband, Deane, grew up in New Caledonia, a French tropical island, and is completely fluent in French so he can also lead tours in that language. If you find yourself in Wanaka looking for something a little different, or want a customized tour for a private function, you can’t go wrong with Funny French Cars! Note: I was a guest of Funny French Cars on this short version of the Gold Digger Wine Trail tour. As usual, all opinions are my own.